David Dean Rusk (February 9, 1909 – December 20, 1994) was an American politician. He served as the United States Secretary of State from 1961 to 1969 under presidents John F. Kennedy and Lyndon B. Johnson. Rusk is the second-longest serving U.S. Secretary of State of all time, behind only Cordell Hull and tied with William H. Seward. As Secretary of State he believed in the use of military action to combat communism. 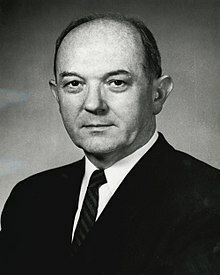 On March 24, 1961, Rusk released a brief statement saying his delegation was to travel to Bangkok and the SEATO nations' responsibility should be considered if peace settlements are not realized. In 1964, Rusk said the US would not be pushed out of the Gulf of Tonkin and that the prevention of it becoming a "communist lake" would be assured by the continued presence of American forces there. During his later years, Rusk showed his support of Richard Nixon and his handling of the Cold War. Rusk died of heart failure in Athens, Georgia on December 20, 1994, at the age of 85. ↑ "DEAN RUSK WARNS OF LAOS DANGERS; ON WAY TO SEATO". Chicago Tribune. March 24, 1961. ↑ Korman, Seymour (September 22, 1964). "Reds Can't Push U.S. from Gulf, Rusk Says". Chicago Tribune. ↑ Jones, William (July 27, 1969). "Rusk Backs ABM, Hails Peace Work". Chicago Tribune. This page was last changed on 27 January 2018, at 07:39.